Beautiful resort on sandy beaches. Grounds are immaculate. We were upgraded to the Turquesa/TRS section of the resort, which was a quieter area with an adults only pool, private beach areas, specialty restaurants and some rooms had a walk-out to a moat-like pool. The wristbands at the TRS had a chip in it for the room key, which was PERFECT- we never had a keycard to carry around. Staff was wonderful; friendly, accommodating, cheerful. Many spoke English and did their best to communicate (and understood much of my limited Spanish). The resort is very large but there are plenty of shuttles running all the time to "hitch a ride" if you don't want to walk. We got lost a number of times when walking, so that was frustrating. The specialty restaurants require reservations, but we were told they were all fully booked, so we were never able to make reservations. Luckily, they accommodated us at a few of them so we were able to try a couple of the many specialty restaurants on the resort. Drinks were delicious and bars were plenty! Pro's: Grounds kept very well. Close to beach. Food pretty good, international selection. Close to shops, nightlife and other resorts. Con's: Staff not very welcoming, many kept to themselves unless spoken to first. Guests a bit snoody. Constant soliciting of goods and timeshare for TRS travel club. Room service subpar, room was not swept nor old dishes removed. The extent of room service was making bed and bringing fresh towels when asked. Pool for Punta Cana out if service for 3 of of 6 days on resort with no explanation nor instructions for alternate options. As soon as we walked in to the lobby we was greeted with drinks and excellent service. Thank you for the VIP upgrade surprise and the personalized letter. We are truly amazed. Best time ever. Thank you. We stayed at the TRS Turquesa Royal. The amenities are superb and the food was excellent. Shout out to La melaza, feliz amd jaime. All the staff treats you like royalty, i mean it. We were at the adults only and i enjoyed every moment of peace and quiet. Restaurant staff was so rude. Waited hours for our food. I arrived on a Tuesday, and became very ill the following day. On Friday, I was transported to the local hospital and put on 4 medications. I was extremely ill 7 of the 8 days I was here, and upon my arrival home, I was diagnosed with Salmonella. I had a short meeting after I filled out an incident report, but no solution other than offering me a better stay “next time” was offered. I paid for an all inclusive trip, but was unable to eat, or drink any liquor during 7 of the 8 days I was there. The staff called this an odd incident saying that I had the only case. I travelled with 14 people, 9 got sick, and 5 went to the hospital. The check in process is horrible. You stand in one line for a long time, for them to send you to another line. The room we had was nice, but we soon realized it was infested with roaches. Baby roaches and BIG roaches. After an hour, they moved us to one of the newer rooms. But ANGEL and FRANCISCO were amazing!! The best vacation I have taken in life! The staff were absolutely wonderful. Treated very well while I stayed there. Hotel was very clean and rooms were big. Had a fridge that was stocked everyday. Just say all you can eat and I’m there! Had a great time. The beaches were amazing. Hotel staff very attentive and caring about your needs. Had to bring out some of my Spanish that I learned in school which was great hadn’t practiced in a while. Most of the staff do not speak English but they will attempt to to meet your needs. very good stay will be back again in the future same hotel for sure!!! Great amenities.Friendly staff. Amazing photographers. Only complaint is there should be more frequent shuttles to go around property as it is massive. Great place. Excelente for children’s under 5 years old. The kids club it’s excellent. Muy bueno. Mi reservación me dio acceso a todas las facilidades de los 4 hoteles de la cadena. El único inconveniente fue que deje mi wallet en la bata que utilice en el Zentropia Spa y a pesar de que no se habían llevado la ropa al laundry y buscamos en todos los paquetes no apareció la cartera ni el dinero en efectivo. El hotel en si muy agradable, de una infraestructura moderna, cercano a la playa y bastante lujoso. Lo que me resulto de terror el servicio gastronómico que ofrecen, ya que tanto en los desayunos como en los almuerzos buffet demoran muchísimo tiempo en acomodarte y en servir bebidas o poner los cubiertos muy mala organizacion. El cafe siempre llega helado, y si pedis un Té, primero te lega la taza, luego a los 30min el agua, y por ultimo el Té te quitan las ganas de desayunar. Algo similar ocurre con la bebida en el almuerzo y cena. En cuanto a los restaurantes a la carta, el servicio es aun peor podes sentarte a las 8PM, te atenderán a las 9PM, la bebida si tenes suerte te llegara 930PM, y la comida al rededor de las 10PM. y para peor en el restaurante italiano las pastas van a llegar frías. Perdiste 2 hrs de tu vida para no poder comer algo rico. regresamos muy decepcionados con el servicio de comida, y es el comentario de todos los huésped. Hay una cantidad desorbitaste de empleados pero todos hablan entre si, pocos tienen ganas de servirte. Es un excelente hotel con buenas atenciones, excelente comida y muchas amenidades. Mi esposo y yo pasamos una excelente estadia alli. Cortecito Beach is within a 5-minute walk of Grand Palladium Punta Cana Resort & Spa - All Inclusive while other popular sites like Arena Gorda Beach are within a few miles (5 km). This 535-room, 4-star property has 5 outdoor pools along with a private beach and a marina. It's connected to the convention center in central Punta Cana and also close to Los Corales Beach and Palma Real Shopping Village. Start your day off right with a free full breakfast, served each morning from 7:00 AM to 11:00 AM. There are multiple options for onsite dining with 13 restaurants, including Boghali, which specializes in Indian cuisine. Order from room service to satisfy your hunger without leaving your room. A flat-screen TV comes with cable channels, and guests can stay connected with free WiFi. The bathroom offers a jetted tub, hair dryers, and free toiletries. Other standard amenities include free minibar items, a furnished balcony, and an MP3 dock. Grand Palladium Punta Cana Resort & Spa - All Inclusive features a private beach, a marina, and a full-service spa. If you drive, put free parking to good use. The 24-hour front desk has multilingual staff ready to assist with tours or tickets, dry cleaning/laundry, and luggage storage. Other amenities at this all-inclusive property include 5 outdoor pools, a casino, and a nightclub. Dear Ash, Thank you very much for sharing a great review of our Grand Palladium Punta Cana Resort & Spa and TRS Turquesa Hotel, it pleased us greatly the upgrade was to your liking. We are so glad that you have felt accommodated by the excellent performance done by our team. Thanks so much for your great feedback we'll bear it in mind in order to enhance our service and at a time, upgrading our guest's vacation experience. We hope to have the opportunity to offer you our services again in the future. Receive warm greetings from Paradise! Dear Anonymous, thank you for choosing our resort to enjoy you vacations and for taking some minutes of your time to share your opinion with other travelers. We are saddened to know that we could not satisfy your expectations about the service in restaurants. For sure, we will share your review with our staff to take the right measures. We hope anyway that you would offer us a second chance to experience the changes. Dear K, Please, accept our apologies for the inconveniences that you experienced during your stay with us, we really hope you have recovered now. We would like to inform you, that the Palladium Hotel is part of the HS Consulting program, which monitors all our standards in food handling, health and safety. This company is a reputed international company based in Spain and our complex applies the highest international standards. This program includes periodical audits concerning health & safety issues. Our resort, with its 2000 rooms is listed as a safe hotel by HS for its quality and high standards. Our Hygiene & Quality Department usually makes inspections with the control risk system of Hazard Analysis Critical Control Points, one of the most effective systems, which help to evaluate all levels of quality in beverages & food and swimming pools. In addition , we do not have any medical evidence certifying that the Salmonella came from food prepared at the hotel. We really hope would come back to live a real Palladium experience. Free full breakfast is served daily from 7:00 AM to 11:00 AM. Boghali - Restaurant specializing in Indian cuisine and serving dinner. Bamboo - Theme restaurant specializing in Asian cuisine and serving dinner. La Adelita - Theme restaurant specializing in Mexican cuisine and serving dinner. El Tapeo - Theme restaurant specializing in Spanish cuisine and serving dinner. Sumptuori - Theme restaurant specializing in Japanese cuisine and serving dinner. Reservations required. 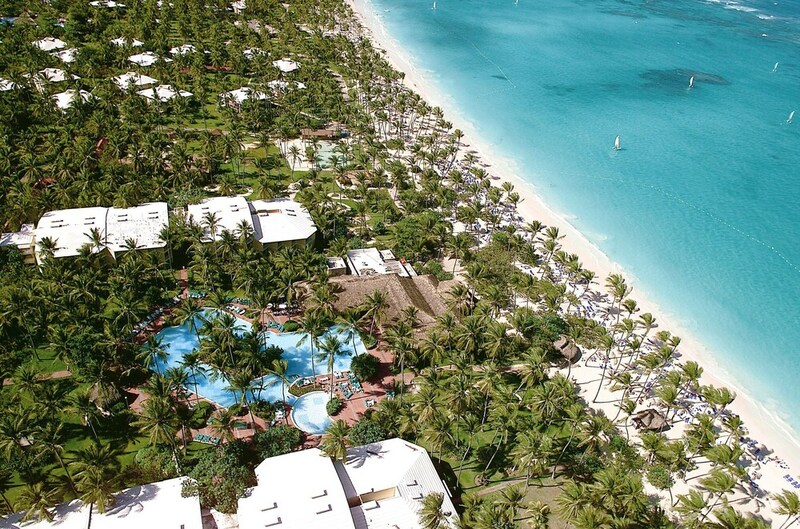 Grand Palladium Punta Cana Resort & Spa - All Inclusive features a private beach, outdoor tennis courts, and a marina. The property has 5 outdoor swimming pools and a children's pool. A waterslide, a sauna, and a fitness center are other recreation options. The preferred airport is Punta Cana (PUJ-Punta Cana Intl. ): 28-min drive, 14.8 mi/23.8 km. The front desk is open 24 hours a day, and checking out is easy with express services. Driving? This property offers free parking. Airport transportation is available during limited hours. Fees may apply. Guests can contact the property in advance for details. Reservations need to be made in advance for massage services and spa treatments. Contact the property at the phone number listed on your booking confirmation. Book a stay in any room or rate category and receive access to the Zentropia Spa (surcharge USD 50 per person, per night) with access to hydrotherapy circuit, healthy bar, 4 different snacks, almonds, and fruits, juice therapy (10 different, 100% natural juices), teas, and Nespresso coffee machine. Full details provided at check-in. An appointment may be required. Taxes and gratuity may not be included. No refunds for any unused portion of offer. Offer subject to availability. Offer is not valid with groups/conventions and may not be combined with other promotional offers. Other restrictions and blackout dates may apply. Airy Bungalow With Private Plunge Pool & Garden - Close to Beach, dog OK!